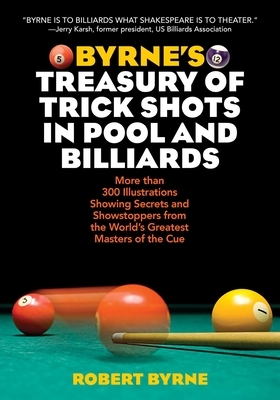 Fully illustratedin color for the first time!with drawings of nearly 350 mind-boggling trick shots, Byrne’s Treasury of Trick Shots in Pool and Billiards will teach you everything from the basic butterfly formation” to the most difficult and impressive shots. Robert Byrne will help novice and experienced players alike perfect their trick shots and learn about the historical context of each trick. Trick shots are anything amusing, surprising, or educational that can be done on a pool or billiard table with standard accessories, and have been around as long as the game itself. Byrne demonstrates historical shots, including some invented by the famous Captain Mingaud, the world’s first professional exhibition player, and newer tricks seen while travelling to tournaments around the world. Filled with easy as well as hard, and technical as well as showy tricks, the book’s clear diagrams, paired with secret insider tips, describe simpler stunts for the beginner, those that take years of practice, and some that the author doubts you’ll ever be able to do. Whether you want to impress a crowd, a group of friends, or yourself, Byrne’s wild, stunning, and unforgettable trick shots will make you question some principles of physics and wow an audience of one or one-hundred. Robert Byrne is the bestselling author of more than fifteen books, including seven books on pool and billiards. His books and videos on pool have sold nearly a million copies. He was inducted into the Billiard Congress of America’s Hall of Fame in 2001.